In my last blog I transformed an old drafting table with glam, gold glaze. 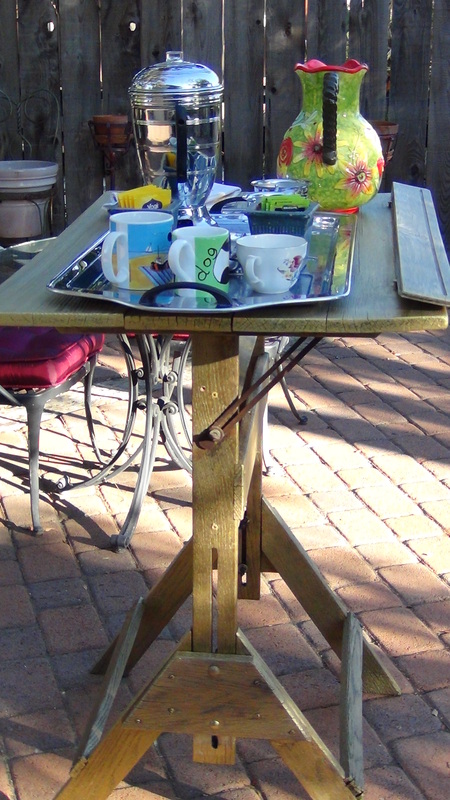 Here’s one way to put it to practical use — as a serving table in my garden. I love mixing metals. 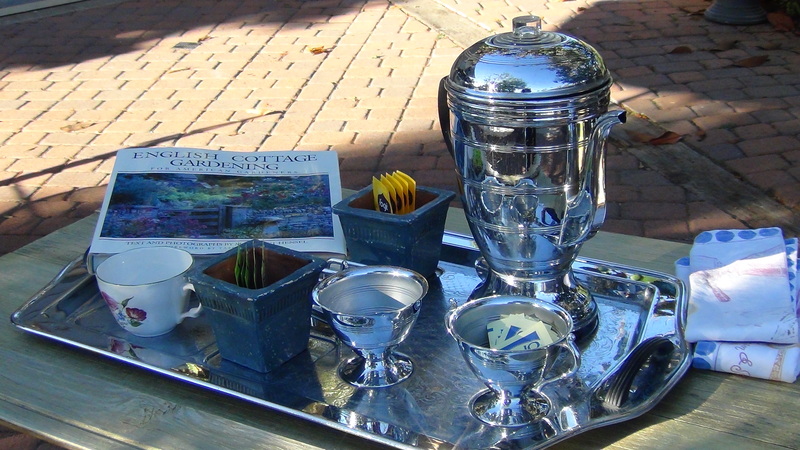 This gold table-top is perfect for the retro, stainless Tea Set and cool tray. Organize your day so that you have time to smell the roses by sitting down with a cup of coffee or tea in a beautiful environment. Nature is one of the best places in which to spend time daily and we’re fortunate in Carlsbad that we can do it year-round. These precious moments are not about grabbing drive-through coffee on the go for a caffeine jolt and drinking it in the car. Take care of yourself with little gestures. A serving table is a simple, elegant way to set the stage for a relaxing moment. Add a touch of beauty to everyday rituals and items. If you can’t seem to find the right space for this kind of self-care, see whether decluttering might help you in your quest. 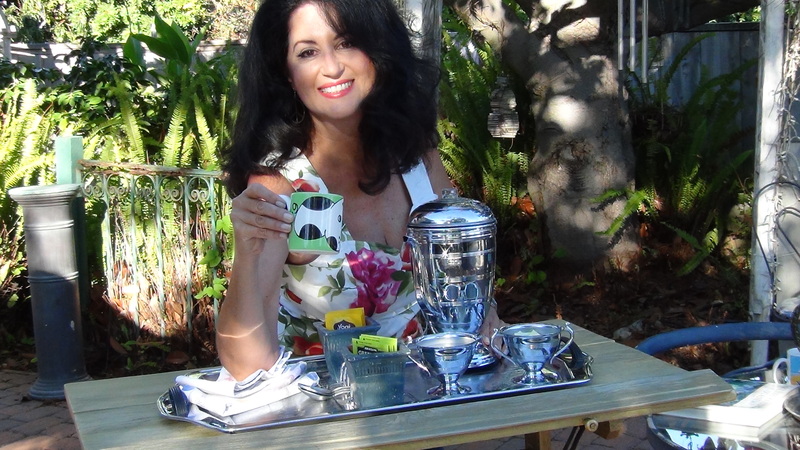 Lighten up on your “stuff” and the space will become clear for new, positive and fun rituals. Although I’m in San Diego county, I like turning my space into an English Cottage Garden. It nurtures me and it’s fun. By creating a horizontal table-top, I get more use out of this drafting table. I repaired and replaced loose bolts and added two braces so I can trust its strength for my tea and water pitcher! 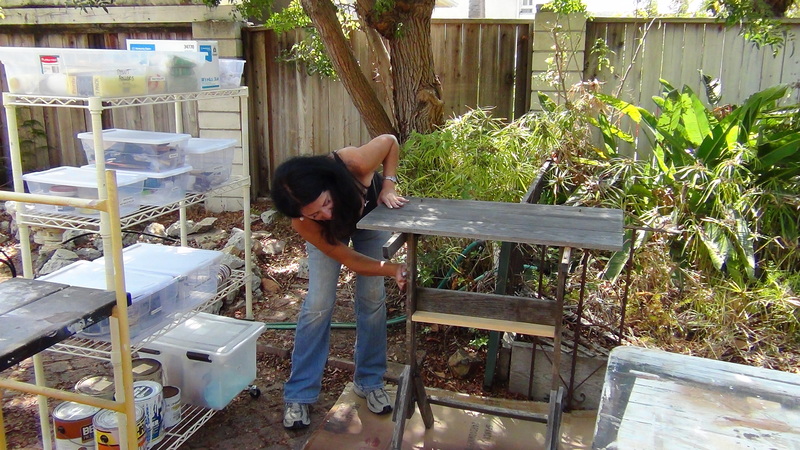 This was a fun, diy project — to transform and repurpose this old drafting table.